First let me say that it is very hard to get photos in here, because the space is small and narrow. This is another of the Valspar paint samples. It is Golden Chime. Don’t know where that name came from, but I guess they run out of names to call paint colors! I thought about painting a thin red stripe down both sides of the leaves, but decided against it. There is more than enough color there on that wall! I painted these little shelves the gold also, a $3 find at my favorite antique mall in Jenks. I brought them from the other place. They were red. There is enough red going on. You can see the bits of gold I got on the wall I will have to fix. Yes, I painted them right there! For all of you who have asked: Where is the coffee? It has always been right here. Just on different pieces of furniture. It was originally on the hand-me-down kitchen cart I rescued. That is now in the kitchen serving as a cooking station, and it too is the gold shade. With the idea-at-the-last-moment to paint the drawer pulls red. The potting bench I painted red about a month ago. And tried my best to use it in the kitchen. But just could not visually get it to work. Frustrated, I left it in there nearly a week trying to think of ways to make it work for me, but eventually just brought it in here and switched it out for the kitchen cart. It’s now living life as a coffee bar. I have tried my best to get a better photo of the potting bench, but this is simply the best I can do within this small area. So nothing earth-shattering here. I may or may not leave the white lamp. I want lamp light in here, but just am not sure this is the lamp I want. It is only 60 watts when, if I do crafts here, I’d want at least 100 watts. Here you can see outside to the patio. I know, you hate the vertical blinds. So do I. But in this heat, I really need them. Considering I paid $10 for the now golden table, I am quite happy with it. The red chairs are so comfy as dining room chairs. I bought them while still living in Texas at Pier 1. They are indoor/outdoor chairs, which tends to be cheaper on the pocketbook. Plus you’re able to utilize them in or outside. I think they were about $59 a piece. Add a nice cushion and you will want to linger here awhile. Your $10 table looks great. I love your kitchen, so cozy! Well, it got painted that color primarily because I already had the paint! The little table is very sweet painted this color. I really like it. I too, have done things like painting shelves left in place. Whatever works, is what I say! It kind of scared me to paint in place. I'm not a very experienced painted in the first place. But I told myself, what's the worst that can happen? I fix my flubs! You did a beautiful job on the table. She was pretty rough looking and it's a complete turn around. Amazing what paint can do, isn't it? Your place gets cuter and cuter every day! I love how you are enjoying it so much! I could never enjoy a home that wasn't colorful or was ugly in some way. There are still some rough spots because my little sander block wasn't too effective, but paint cures a variety of ills. The table looks great. If you decide to add red to the table, I would suggest putting a couple of thin red stripes on the table legs, somewhere on the decorative turns. Just a touch. Painting the shelves yellow was a good idea too. Your lovely quilt really ties everything together. Thank you. I'll probably leave well enough alone. Particularly since red means I make an even worse mess and it's hard to get up! Oh, so, pretty ! I love your little yellow table and the red chairs.. 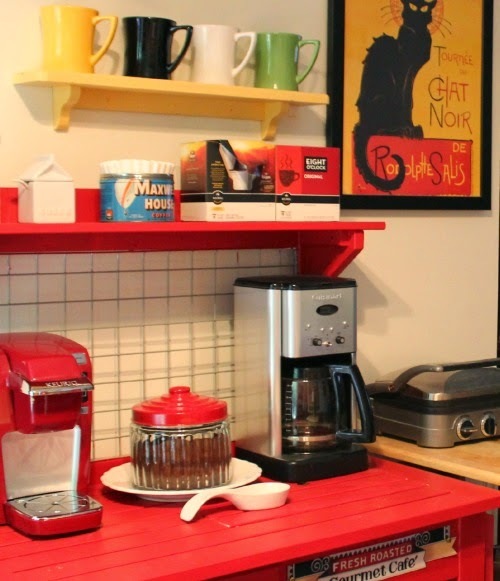 I also love the fact that you are using your potting bench for your coffee station.. It looks great painted red.. The yellow/gold in your quilt just make everything go together.. 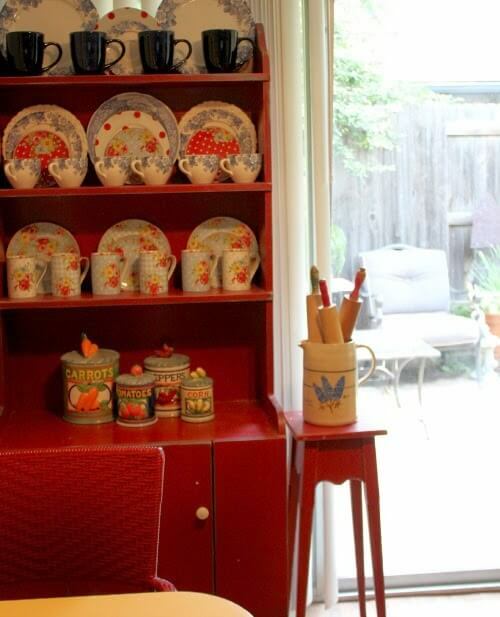 Your little plant stand with the pitcher and rolling pins is precious.. AND, your red hutch looks like it was made for that space. You're really getting it all together Brenda.. Enjoy ! I think my "get up and go, got up and went" or I would be having a paint brush going or some wall paper going up on my kitchen wall. Maybe when the weather gets cooler ? My get-up-and-go is getting weary. Going out in this humid heat drains a person. So I just don't go out anymore than I have to. It would be unbearable without air conditioning. I feel so bad for those who don't have it. I've just been a "paintin' fool" haven't I??? I LoVe what you have done, Brenda!! The table looks amazing, and the little shelves too, and the way it all works together is so great! It really is a cosy home with all your clever touches. I wouldn't know what to do or where to start with a big house, just like I didn't know quite what to do with a big yard. But give me about three rooms and a small footprint and it's amazing how much easier it is! But you, Helen, are the absolute master of color. I surely will keep on sharing. And if you figure out a way to jump through that screen, coffee will be served. I love your $10 table! The golden color is beautiful. Your dining area is fantastic, thanks to your decorating skills. Simply amazing! It's tiny, but functional, now. Lovely, lovely. The little table fits so well, looks like a little tea shop. The potting bench is great in the dining area. 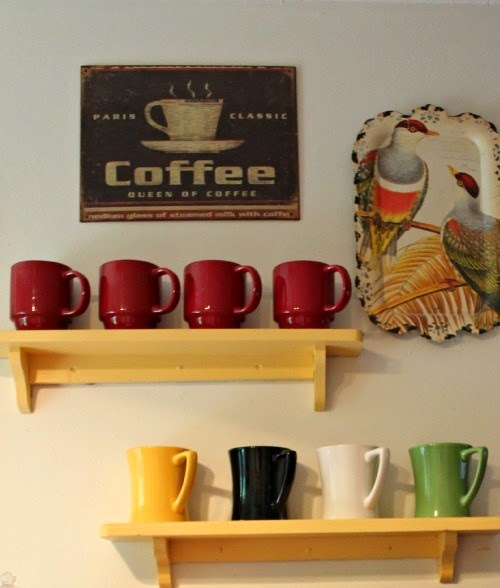 The shelves on the wall and the potting bench mean more display space, and the yellow coffee bar in the kitchen is better work space. Good choice switching them. You are making a comfy cozy home. Well, I've been lucky to come up with the right pieces for the right purpose. 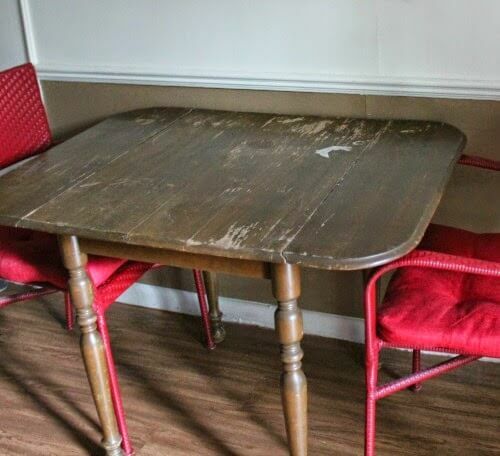 The table is perfect for your space, Brenda…I love how it will be dual-duty for crafts, too! The gold shelves make a great pop of color! Just about everything in 725 square feet has to serve dual duty! Love the yellow table!! Also the quilt above it! Really like your new header. Gorgeous. You are becoming quite the experienced painter! I'm proud of you. It will probably stay up there for awhile till I: am in the mood to get back up on the step ladder, and remember it's there while I'm at it! What a difference a coat of paint makes! That table is like Cinderella, she had a hard life but along came her fairy godmother with a paint brush and she is beautiful! And she has fine curvy legs to show off too. Look, paint and I have never mixed. My second husband told me that. And if I am brave enough to do it, so can you. I am finally learning that a little bit of red goes a long way. And needs suitable colors to be the simpler, easy-on-the-eyes backdrop. It looks so good! I have been anxious to see what you did with this table, I need one just like it. Now I'll be on the hunt. Such a charming area 🙂 And don't give those blinds a second thought, I really would not have even noticed them if you hadn't said something. Useful is better than pretty any day! And wow it's hot, every drapery in my house is closed right now! Looking forward to the cool down this week for sure. I think we're "supposed" to get a couple of cooler days. But I'm not counting on it. The reason I mention the vertical blinds is that people have mentioned how awful they are. But awful they will have to stay. Reminds me of the ugly duckling. Poor thing even got painted the color of a duckling, now that I think about it! I smile till I walk into the bathroom, and then I frown. Hardly any room to turn around, and barely any walls to work with. But eventually I'll get to it and think of something. And those horrid long lights with a row of glaring bulbs spanning across the width of the sink. I use a lamp instead. These sample colors make me bold, and I'm not bold when it comes to painting, because I don't have the actual expertise of having painted a lot. If I mess up, well, I've just lost less than $3. Not a tragedy. One of the traits I seem to inherently have is mixing colors. Sometimes I wish I could trade that with being able to navigate and drive and not get lost all the time. Great job on that table Brenda! 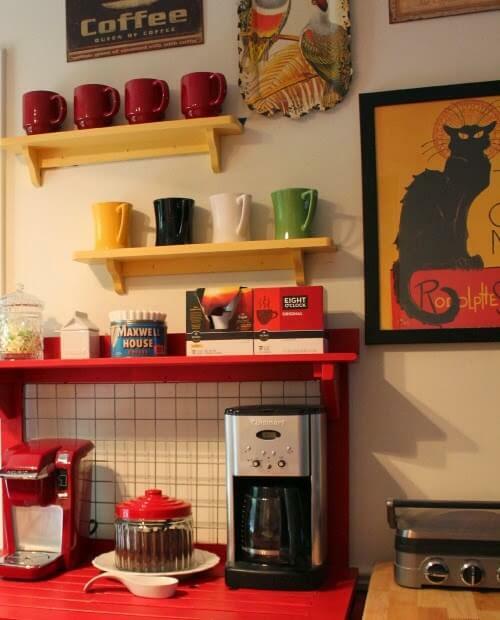 LOVE the shot showing the yellow cabinet that holds your microwave…lovin all that red and yellow…so pretty! There's just something a bit magical about combining red and yellow. Brenda you certainly brought it all together! 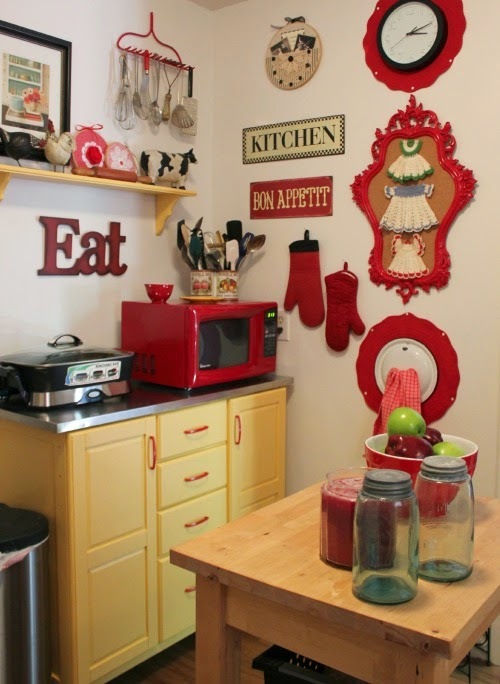 Love red and especially in the kitchen. I wouldn't worry about the blinds, we all know how bad the heat can be. I live way down south and it's hot and wet all the time in the summer. You feel like you are in a hot shower with all your clothes on and a coat! The only thing i wouldve added wouldve been to paint the very tips of the table legs up to that ridge area…..the contrasting shade you used on the gorgeous hutch…..kinda blend it all together. Either way they both turned out so nice!! I don't know if I can paint that exact. I have only painted a few things over the years. I'm just now getting my confidence to paint at all. I'll try something like that someday. It is very cute! Love some bright cheerful yellow! Kind of a mellow buttery yellow. Like butter on biscuits. 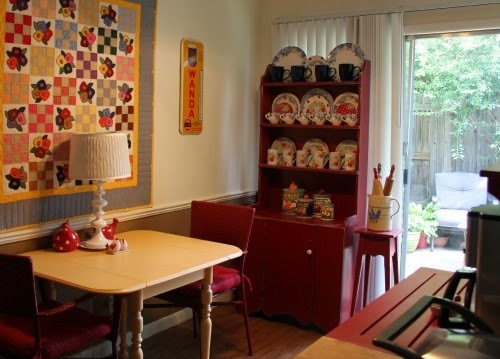 Your table is wonderful painted that yellow and it is perfect with the red! You have such a great eye for color! I'm stuck in 'neutral' and want to step out and add some color to my home. Any advice? Don't get overwhelmed by bringing in too many shades of color into your thought patterns. Pick a few colors. Like the smallest crayon box colors. And then start choosing one shade of that color. Get your color confidence by taking small steps. I wish I could paint as well as I can choose paint! I had several bright yellow walls when living in TX. I don't want to go that bright. I want to use shades of a golden yellow in my decor now. If you mean the dining space, if I stood on my head I couldn't get complete shots of that area. If you mean the whole apartment, I'll have the living room ready to view changes I've made once I get the gallery wall finished. A gallery wall takes thought and time, patience. And I haven't done anything to the bathroom yet. It's pretty generic and tiny. I love that you are adding new colors, and the gold is so lovely. Colors like that are "happy". I am thinking of painting my front door a bright color. My house is taupe with black shutters and a black front door, but I want the front door to pop. Seeing your bright colors makes me feel brave! Oh, there's so many color directions you could head into! What are your fav colors? Do what makes you smile. Love the table and everything you do is beautiful! You really know how to pull it all together. Your colors always make me happy even though I am a girl who likes white, I still love your colors. Well that's quite a compliment from a girl who loves white! Thank you. 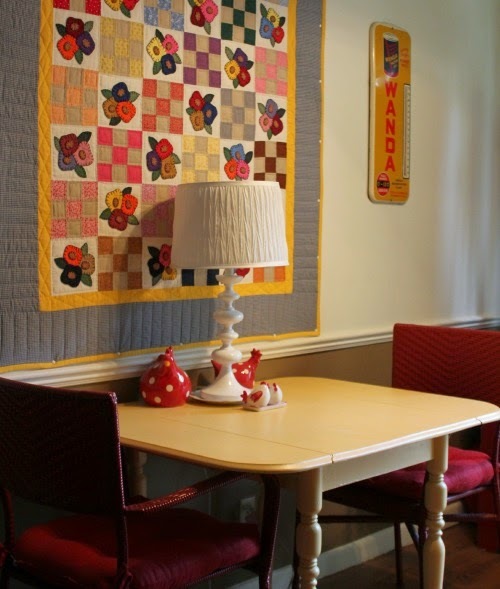 Your little old/now new looking table is cute in yellow with the red chairs. The yellow and red look so cheerful together, and your pretty green buffet from yesterday….. everything looks wonderful. As I was looking around, I saw your scroll-y red picture frame with the little crochet dresses in it. Now I am planning on framing the two little red and white crochet dresses that I currently have hanging on a cupboard knob. Yours look so cute framed. It never occurred to me to frame them until seeing yours. Your posts always give me fresh ideas on ways to paint and arrange furniture and décor. I do wish I had the patience to sand and prime and paint like you do. You can ask Judy about my patience. Quite thin! I couldn't come up with what to do with the little crocheted dresses/pot holders, so decided to just put them on the framed bulletin board. My advice: Try everything. Something will work. I like what you've done with your table! It is just so adorable Brenda. Painting the shelves to match was a great idea. 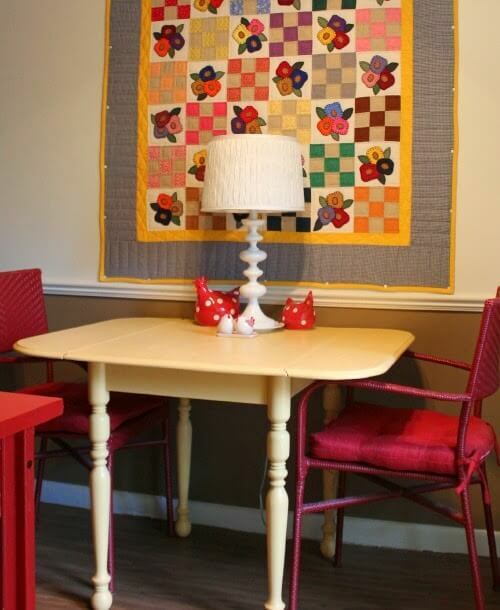 The quilt on the wall makes it all tie in well together. You are such a busy little lady! You put me to shame with all you get done inside. Remember I live in a small apartment with a living room that extends into a dining space, a small kitchen, a small bathroom, and a bedroom. Not really all that much to decorate. I like to stay busy. To me, this gold looks a lot like the lustre of light coloured wood, and thus adds an extra richness to the kitchen table, the kitchen cart and the shelving. Brenda, I can't believe, (although I'm not surprised! ), that you have managed to co ordinate everything so well together, incorporating your beloved red, white and new love, apple green into your new space. Waking up to all these cozy nooks, (and yes, even before that first cup! ), must be soothingly sweet! Enjoy it, my friend…we are! Brenda the table is fabulous! Wow the price was right. I can look at your adorable kitchen all day!!! It so darn cute!!! I know there are all manner of trendy expensive paints, but it's too rich for my budget. I feel okay spending about $3 at a time. Love the table and its ugly duckling story. I also love the color you chose to paint it. Ducklings aren't always ugly. Wonder where that story came from? I like your $10 Kitchen Table. With the lovely sitting area and tables and beautiful chair set. DO NOT COMMENT ANY LONGER ON MY BLOG, LAURA MADALENE. YOU ARE SPAMMING ALL MY FRIEND'S BLOGS AS WELL. STOP THE SPAMMING AND PLEASE MOVE ON. I thought at first it was a little too simple. But it's got great legs, and sometimes simpler, I keep telling myself, is better. My kitchen is done in yellow and sage green…so I'm lovin the color you chose! Well, we are color kin! The gold looks great with the red! Love the colors you use! The only colors I really don't use is purple and pink. I'd love to add maybe some lavenders sometime, but not sure how to work it in. Your table looks fantastic. God Bless Judy to see past the sad table, because now it is a beauty! She said she was just driving along, not thinking she wanted to stop, until she saw the ugly duckling table with legs that were straight and thought: Brenda won't trip over those. And so she called me and I said: Get it. What a great deal on the table!! I love the gold/yellow going on. I wonder how that lamp would look painted shiny black? It sort of blends in with everything now and yet you don't need another "color". Keep up the good work! Can't wait to see the gallery wall. I'm going to the cheap antique mall in the morning, before it gets hot, and see if I can find some "littles" to finish out my gallery wall. I had a "B" monogram I got last week from Hobby Lobby, but dropped it and it broke into a hundred pieces. What do they make things of nowadays? Junk. Since it's been painted you would never know what it looked like before. Love the color, and I know you let Judy know she has a good eye! I like the lamp white, it gives your eye a place to rest with the other color. Looking forward to the gallery wall….I wish I could have one, but my house has NO walls, all windows! I thought about painting the lamp, but you're right. The eyes needs a place to rest, just as it does in the garden. I absolutely adore the look and COLORS of your Kitchen!! They are my favorite colors for the Kitchen and they warm my heart as I am sure they do yours!! You have done an amazing job! Well, I thank you mightily for the compliment! Oh, gosh, your new place is magazine ready. I love a lamp on the kitchen table and I always have one. It makes the whole kitchen so cozy at night. I think I have three small lamps in my kitchen! This is such a pretty, colorful space! How nice that you can look outside, too. I love you bright and cheery kitchen!! Feel free to come to NC for a visit anytime! I will gladly pay you to redo my kitchen and some other projects for me:O) A girl can dream! I just wanted to say a huge Thank you for a tip you gave on gardening a few years ago. The clearance flower and plant racks at Lowes!! My hubby and I have well hubby really have planted 12 knock out roses this year, two new hydrangea plants, 10 hanging baskets, 3 of those planters that have a variety of plants in them, 8 more perennials, 20 some tulip bulbs, and other assorted flowers all purchased for 1.00, 3.00, or 5.00!!! Our yard is looking so beautiful along with the front porch!!! I will never pay full price for plants or flowers again. Each and every time we go to Lowes they have rack after rack of clearance flowers! Most of the time, the flowers still look great. I got a cute geranium in a bright yellow watering can for 2.00 and after some plant and flower food, it is blooming again!! Thank you again for all your tips and ideals for gardening and decorating a home on a budget!! Big hugs to you!